FANUC has extended its M-10iA range of materials handling robots with the introduction of the high speed, long reach M-10iA/8L. Capable of handling payloads up to 8kg, the M-10iA/8L offers a reach of 2028mm. 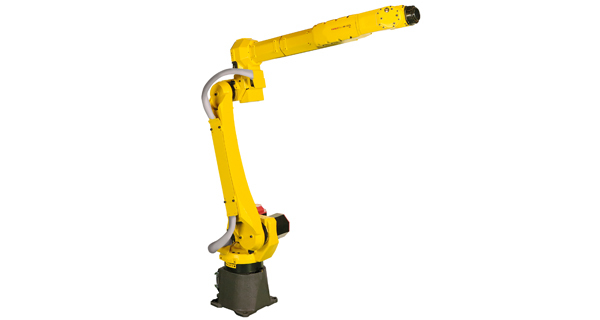 Previously users looking for such a long reach would have had to look at a much bigger robot in the FANUC range – the M-20iA/12L – but the M-10iA/8L is 40% lighter and 20% slimmer, addressing the needs of applications where space for robot access within a machine is limited and angles of access challenging. The M-10iA/8L will also prove more energy-efficient and offers a number of performance benefits in situations where a high payload robot is not required – offering a reduction in power consumption of up to 30% contributing to overall profit margin. In addition capital cost savings of a smaller, lighter robot wide a wide motion area. The M-10iA/8L features a new J2 arm and an extension adapter in the J3 arm, meeting the needs of applications requiring the moving of heavier parts within a larger working envelope. The new design of the J2 arm provides a 20% reduction in the interference radius compared with the larger M-20iA/12L, contributing to the slimline, lightweight design. Further, the modular design of the robot makes it a particularly cost-effective solution, while the shared parts with other robots in the M-10iA range – including motor, reducer and controller – ensures maximum parts availability and easy interchangeability. Performance has also been enhanced, with optimised acceleration and deceleration control for the wrist payload enabling cycle times and therefore productivity to be improved. The use of the latest servo control technologies ensure vibration-free and more accurate positioning, even following high speed transitions with repeatability of ±0.08mm. This combines with a wrist design that offers the best wrist movement and inertia in its class. The slim, lightweight arm of the M-10iA/8L will address the needs of machine load/unload applications where the available space for robot access is limited, allowing access into the tightest of spaces at difficult angles without interfering with exposed machine components, cables and hoses. Further, the hollow wrist and arm allow all of the M-10iA/8L’s cables and hoses to be routed through the robot’s body, contributing to increased operational reliability by keeping those hoses and cables out of harm’s way and preventing snagging in confined cells. It also enables the full motion potential of the wrist joint to be utilised. At an overall weight of 150kg, the M-10iA/8L is some 100kg lighter than the M-20iA/12L. It also increases mounting flexibility with the ability to be wall or ceiling mounted, or installed at an angle. Further, with the reach of 2028mm, the M-10iA/8L offers a useful extra 19mm than the M-20iA/12L, with a wider motion range including flip over area. The M-10iA/8L will bring increased flexibility to a range of packaging tasks, enabled a wider variety of products and package sizes to be handled on a single production line with reduced emphasis on manual labour. Suitable for picking and packing products on conveyorised systems or for integration into special purpose packaging machinery, the M-10iA/8L can pick products reliably regardless of orientation, with the long reach and slimline design enabling it to reach inside the most confined of spaces and negotiate difficult angles. The M-10iA/8L is likely to be of particular interest to industries that struggle to deal with ergonomic issues, labour availability, legislation and the need to improve key performance measures such as overall equipment effectiveness. Even when space is an issue, the M-10iA/8L can be flexibly integrated into handling lines for picking, placing and filling operations, delivering precision at high speed, contributing to production efficiency improvements, and eliminating the risk of repetitive strain injury in what might previously have been manual operations.